The big news today is that our mudroom lockers were framed in. The idea was to have 3 cubbies for the three of us, and one small closet with a door for extra shoes and future puppy supplies. Our cabinet maker will make the door, which will match the kitchen cabinet style. We'll hang a mirror on the inside. As a comparison, this was our inspiration picture. It was the closest picture we found to what we wanted. Since it wasn't exact, I was a little nervous about Chris getting it right, but I'm really happy with how they turned out. 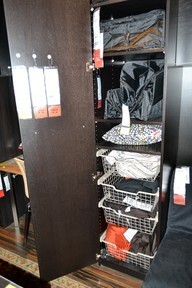 This is the inspiration for the small closet. We want to have a sliding drawer basket for each of us, but we'll start with regular shelves with baskets for now and upgrade later. In other trim news, we still talking through the fireplace trim above the mantle. We're almost there. We also saw a little progress on our niche bench. This picture gives an idea of how the the bench will extend slightly past the bench. Tomorrow Joe Yoder will be back in the house installing my command center (apparently the new name for kitchen desk), laundry cubbies, and master bath shelves. We'll also talk to him about the locker door and deliver the news that the double oven we got such a steal on this week has slightly different dimensions (2" taller) than our previous choice. Ouch. Updated: Here's our completed mudroom lockers!